Consumer products have always put the user experience above all else and now the same is happening in B2B software. It’s time our SaaS sales strategy caught up. That’s quite a change for someone like me who’s spent the last 15 years selling to enterprise businesses and working at sales-first companies. A common refrain when talking to the engineering team in the early days of my career was: “I sold it. Go build it.” It was something a lot of us said without considering the integrity of the product. Now I work for a product-first company and our approach at Intercom speaks to the growing consumerization of B2B products. Custom builds are no longer the norm and business customers today reject the clunky interfaces that were so prevalent only a few years ago. The only way to differentiate is by being a company that puts the customer at the heart of product development. The same philosophy applies in sales, not just in product and engineering. Having studied organizational dynamics over the last four years, I’ve realized that B2B companies are defined by the businesses buying their products and the people that end up using them. But it’s not just anything about these businesses that matters, it’s the size. Since not everyone has had the chance to study organizational dynamics, I thought I’d better come up with an analogy that a broader audience can understand. I’m currently applying to kindergartens for my son, so I’m using an example that is very much on my mind: education. Just as institutions grow in complexity as you advance along your educational journey, B2B companies, their needs and their constraints become more sophisticated as they increase in size. To acquire and retain customers, you need to understand how those differences in size impact the day-to-day tactics your sales team uses and the sales processes you implement. Early-stage startups with fewer than 10 employees have very specific constraints, including limited funds and a clear eye on growth. You need to make it obvious how your solution will help them reach an inflection point for their business. The company most likely consists of founders and engineers. They tend to act like consumers because they’re often spending their own money. They try to limit spending on tools and if they can, they build it themselves. Sell to them like you would sell a consumer product. Make your product self-service and easy to buy and upgrade. At this stage, the company is likely bringing in some cash, although they’re probably not profitable. There’s a good chance they’ve raised capital and have money to hire their first salesperson and marketer. They’re still conservative when it comes to spending. The company is most likely building out their first go-to-market function. Their focus is on product development and building out their MVP. They’ve typically raised funding and are starting to spend other people’s money. They’re buying more tools but they still tend to get a lot done with just a few of them. Now’s a great time to introduce your solution and grow with the company. Customers at this size are willing to spend real money on the right tools. Most companies at this size continue to prefer self-service products because the decision-maker, economic buyer and end user tend to be the same person. This when something entirely unfamiliar becomes a necessity: middle management. Companies at this point start to invest in key senior hires, from engineering to marketing, and role specialization is the new normal. While individuals likely wear multiple hats within their business function, you won’t find engineers trying their hand at marketing or salespeople doubling as product designers. The company has chosen one of two paths: raise more capital or pursue profitability. The company has a new layer of middle managers who mediate between the executive leadership and individual contributors. Individuals now report to specific departments and each team has their own set of tools. The company starts to buy more “enterprise” products and the economic buyer and end user are likely no longer the same person. At this size, it makes sense to invest in building your first sales team. The deal size for these companies justifies having salespeople actively manage and close them. This period of time is often considered an ideal time to sell your solution into a company and turn end users into internal advocates. It’s right before hyper-growth starts. Companies at this size have a viable solution in the market and are starting to transition from a startup to a “scale-up”. They’re growing their business strategically and implementing formal processes and procedures to drive toward revenue targets. They typically have formal budgets earmarked for each department and that are tied to departmental goals. The company most likely has a robust layer of middle managers who are responsible for sub-teams in the larger department, e.g. demand generation in marketing. Each department has its own budget, tools and goals for which it is responsible. Each subteam starts to buy its own tools but approval may require involvement or approval from the executive, legal and IT teams. This is a profitable segment for sales teams to pursue and there are many companies to prospect and sell to on upper end of the SMB market. IT normally becomes a requirement at this stage and that means you’ll need their approval before the contract can be signed. Get your product’s technical specs ready. Your sales team will need to get savvy when it comes to identifying the economic buyer. Your internal champion likely isn’t the one holding the purse strings. 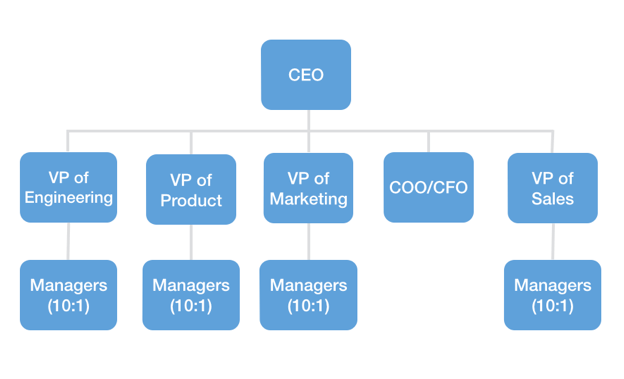 These companies have introduced yet another layer to the management structure: managers who manage managers, or directors. Focused on sustainable growth, companies at this stage are more mature with systems for doing work, not just processes. They’re established in the market and their goal is to become the market leader. Processes are now organized into systems that govern how work is done. The impetus is on sustainable growth so the company becomes the clear market leader. The company might be exploring liquidation events: IPO or acquisition. As a result they have strict legal requirements and new tools need to comply with these requirements. This is another profitable segment where having a sales team can accelerate your company’s growth. These deals need to be actively managed and closed. You might consider having both inbound and outbound sales at this stage. With outbound sales, you can strategically target high-value accounts within this segment. Your salespeople will need to have experience navigating organizations this size and aligning the interests of various departments, from legal to IT and security. This is the size of company that I’m most familiar with having sold into for nearly seven years. It’s also the hardest one to get right. Companies at this stage “act big” but don’t spend as freely as giants like Salesforce or Oracle do. That said, they still require the same dedicated attention from your sales team because having over 750 people means many layers of complexity. Some of these companies may be newly public meaning a focus on profitability and less cash available to spend on new tools. The company likely has complex purchasing requirements and every purchase must go through multiple stakeholders from within the department and across the organization. Procurement gets introduced at this stage which means extending your time-to-close. Historically this is a difficult space to sell into because of the organizational complexity. You will likely need an outbound sales team to establish connections with the right stakeholders at this company and to work the deal from multiple angles. Your salespeople need to establish close relationships with senior executives at your company. These buyers need validation and support from the very top. 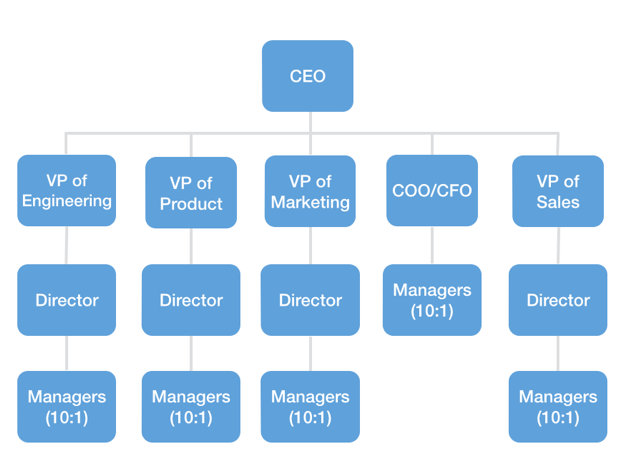 For companies this size, there simply isn’t one typical structure. I don’t have a lot of experience selling to companies bigger than 1,500 people or working at them. What I’ve heard from my peers is that it’s more like selling into governments where each business function is its own mini-company. You’ll need an entirely different sales strategy to succeed here. If you are in the business of selling to other businesses, a one-size-fits-all approach is not the most efficient one. Self-service will work effectively for early stage companies and is a great way to target the SMB market. But by the time startups grow beyond 75 people, a sales force targeting them will start to pay off. Just one lesson stays true: to meet the needs of your customers, current and potential, your sales strategy needs to evolve as often as they do.